How much damage do grenades do? I set one off inside a pressuretank, and the floater armour remained intact. I think it might be better to up the damage so that they can break everything, and reduce the area of effect. The knockback is probably ok how it is, but it might be fun to make it even more powerful. Like I said earlier, there's going to be a massive part hp rebalance with v0.5, but I will probably bump grenade damage up to 10,000 to make them sure to destroy anything in their path. Also hooks should now be able to detect the platforms and pillars, and possibly energy bridge fields, which should enable making some more interesting arenas. I'm surprised you can make such a fundamental change to the hooks in assembly That's going to be a pretty great change. The truly interesting thing about hooks is that the distance is only used to determine whether or not the hook can grab, it actually doesn't grab onto the object (hex or planet) it is close to, it grabs onto the fabric of the universe (which is why it can't grab onto parts). In that case, it could be useful to have the option to override the check to make hooks able to fix at any point in space. That behaviour kinda explains why blueprints of bots with active hooks don't work properly. I wonder if there's any way to stop blueprinted hooks from disappearing off to the coordinates they were saved at? For this to work well, you must hover your mouse on the surface you intend to put the bp on. The orientation of the blueprint is decided by where your cursor is when you press shift + ctrl, not where you finally click. The concussion is effectively a 'special effect' at the level of damage it has, any reasonable-sized bot is going to be completely destroyed by a grenade explosion, and anything that isn't (ie only catches the edge of a blast and loses a few outer pieces) isn't going to be affected by the blast. It would be cool to have a 0 to 1 float value that can be input to a grenade that alters the proportion of blast damage and concussive force but probably not achievable at this point. Still crunching the numbers on the plasma cannon damage thing, and cant decide on a DPS value that seems right. It's mainly trying to get a dps value that works to not make 1 or 2 capacitance weapons not horribly OP, yet also doesn't make high capacitance weapons only get their advantage from higher velocity. Thanks for finding that fix for blueprinted hooks, that should be useful. Given how difficult it is to aim accurately, there probably isn't a way to discourage the use of rapid fire without making low energy shots mostly harmless. If low energy shots were nerfed that hard, I wouldn't be surprised to see combat shift to much closer range or entirely switch to melee, which would likely end up with the two bots ramming each other resulting in a mutual kill/disable. As you mentioned earlier, adding a massive damage bonus to high energy shots is pointless if they still only take out one part. Perhaps it would be possible to make the projectiles continue to exist for a while after hitting a part, or make higher capacitances fire multiple projectiles is rapid succession. Yeah, as I stated before, I think there's a place for that style of robot, but it shouldn't be the only viable tactic. There are other options like increasing the force a part receives when it is hit by a high energy projectile, that could be changed to increase exponentially, as that force can cause other parts to be ripped off their connections or otherwise disrupt/interfere with the target's operation. At this point it's probably ok that capacitance > 10 is less useful in damage terms, as the increased shot velocity has it's own benefits (easier to generate a hit at medium/long range for one) beyond the damage that it causes. Doesn't it take an absurd amount of force to break connections? If you can make it work, making high power projectiles able to cause serious knockback could make for some interesting strategies. Perhaps it's time to get an ACL thread going again, unless there are any more serious changes to discuss. Giving hooks a field of view would be nice, but I'm guessing that it wouldn't be feasible. How would said fov works? Give you the closest intercept in a cone? give you an array of intercepts ? Or make you a depth map? Because if its the latter it would be awesome as you know but the programming system is too limited blablabla... I wonder what kind of super smart bots people could come up if they had access to better sensors and better programming. One guy can dream. I'm also anxious about getting that thread but of course take your time if you need to work on some stuff first. Returning the lowest distance in a fan pattern would be the most useful with the current system in terms of navigation. I've tried making a radar-like scanning system before, but it all gets rather complicated to extract useful information from the output. The sum total part count of any 2 of the bots must be under the part count limit for the weight class: ie You can have 2x10 part bots and 1x20 part bot as a 'lightweight' entry, but not 2x15 + 1x20. Parts used to connect the bots together for blueprinting purposes, and parts used for central control do not count. There may or may not be some other things that I never bothered writing down before I stopped actively developing XFM in 2014 but that should be everything. "The sum total part count of any 2 of the bots must be under the part count limit for the weight class: ie You can have 2x10 part bots and 1x20 part bot as a 'lightweight' entry"
Why? cant you just limit the total no of parts to the weightclass limit? That would be more on an apple to apple comparaison and simpler anyway. three 30 parts bots vs one 60 parts bots sounds unfair to me. "1) Detached from the other bots at the start of the match"
Thats a loophole to allow bots as long as you split them after the match has started. 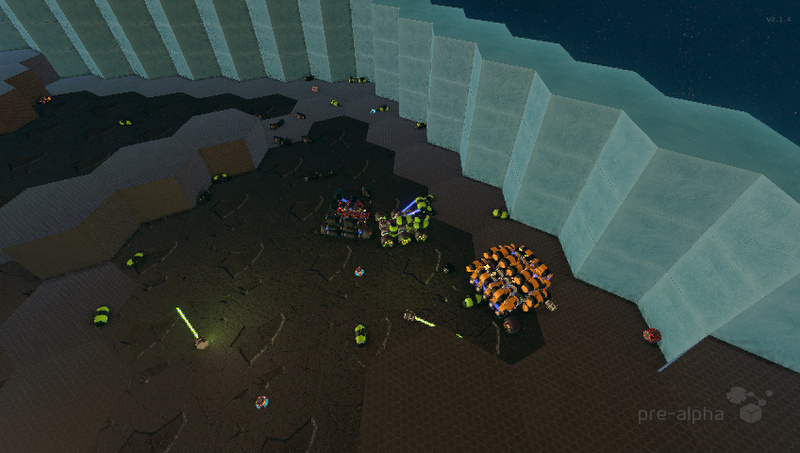 I agree that it would be unfair for a single swarm bot to exceed the limit for a single bot. 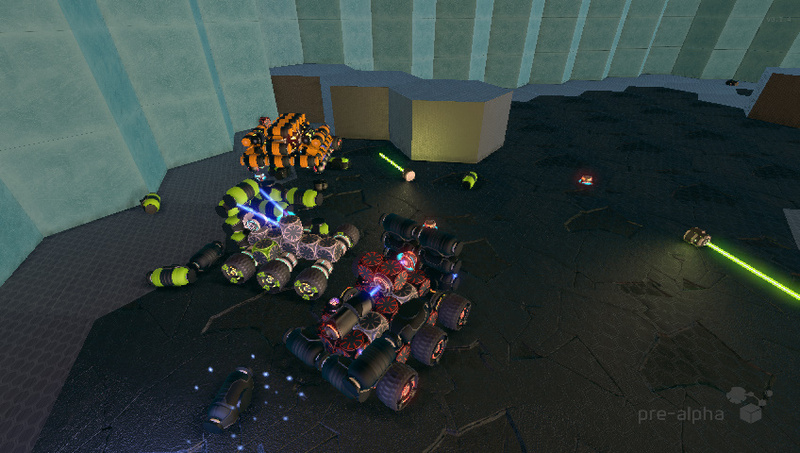 If anything, the swarm bot should face a penalty for having a numerical advantage. You couldn't really fix it by having the swarm fight multiple opponents, as multiple independent bots would have a lot of friendly fire incidents.